Imagine! 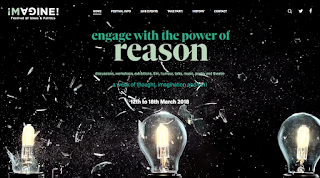 Belfast Festival of Ideas and Politics starts on Monday 12 March and runs through to Sunday 18. It's now in its fourth year of creating collisions between politics and arts, conversation and performance. Events include workshops, talks, exhibitions, film screenings, performance art, music, theatre, poetry, tours and comedy, with the majority of events free. The full programme can be found online (or in a PDF). This year's competition invites you to submit a 1-2 minute film describing a change you want to see in the world. Mix your imagination with your reason, pick up a political or cultural cudgel, have a rant, or create an animation. The organisers are looking for thought-provoking submissions, new perspectives and thinking that challenges established orthodoxy rather than technical masterpieces. Smartphone or tablet footage is perfectly acceptable! The deadline is 18 March and the Victoria Square Apple Store are running extra training sessions during the festival if you need help getting up and running on their range of devices. 10. The Bare Necessities sees artist Kate Guelke barricade herself into The Barracks (off Hill Street) and will rely on visitors and their gifts for company, food and water. Visiting hours at this durational performance run from 11.30am-2.30pm and 5.30pm-8.30pm. Call in with a gift and your presence, or watch online. 9. Homeward Bound is a 30 minute play which tells the true story of Lesley and her 49-year old husband Seth Goodburn who was diagnosed with pancreatic cancer after a short illness and died just 33 days later. It's a play, written by playwright Brian Daniels, that gives people (including health and social care professionals) the opportunity to reflect on the importance of compassionate person- and family-centred care at the end. The play will be followed by a discussion with the actors and Lesley Goodburn. Accidental Theatre in Shaftsbury Square at 3pm on Monday 12 March. 8. EIGHT is a theatre piece by Ella Hickson that asks its audience which six stories they want to hear from a palette of eight actors who play a student, a cheater, a teenager, a parent, a socialite, a high flier, a rebel and a homosexual. Directed by Rachel Coffey and produced with Queen's University Drama. Accidental Theatre, Shaftesbury Square from 7.30pm-9.30pm on Tuesday 13-Thursday 15 March. Whose story do you want to hear? 7. Emmet of Arabia is a one-act play that looks through the eyes of the parents of an 18 year old lad from Derry decides to do something about the endless, unjust wars around the world … and joins Isis. Paddy and Claire are mystified as to how this could happen. Hilarious, touching and political. Presented by Mockingbird Theatre Group in the Sunflower Bar at 8pm on Wednesday 14 March. 6. Join the gang from Banterflix film podcast to watch All The President's Men in The Strand Arts Centre at 8.30pm on Wednesday 14 March. Recently released The Post could be seen as a prequel for this 42 year old classic film which documents the Washington Post investigation into the Watergate scandal that ultimately led to the fall of the Nixon Presidency. Given the current interest in the White House and the continuing topicality of concepts like 'fake news', this 42 year old film is contemporary with its timely reminder of the importance of good journalism as a means to hold those in political authority accountable for their actions. 5. Another film in the Strand Arts Centre. This time, celebrating the 20th anniversary of Eoin McNamee's Resurrection Man which is based on the deeds of the Shankill Butchers in 1970s Belfast. Told retrospectively, a journalist (James Nesbitt) is on the trail of the leader of the ruthless and murderous 'Resurrection Men' gang. Eoin McNamee will be in conversation before the film. 8.30pm on Thursday 15 March. Over 18s. 4. Terror by Ferdinand von Schirach. A Lufthansa-Airbus is high-jacked by terrorists. Strapped into his Eurofighter, Major Lars Koch is ordered to divert the Airbus from its course. With 164 people on board, the flight suddenly changes course towards a football stadium with a capacity 70,000 crowd gathered for a soccer match. If the terrorist do not change course, can he, should he, shoot down a passenger jet? The clock ticks. Major Koch makes a decision. And the audience must deliver their verdict. Can human life ever be measured against others? Who is responsible? Who is on trial? Duncairn Arts Centre at 8pm on Thursday 15 March; QUB Senate Room at 5.30pm on Friday 16 March. 3. A 3.6m Public Pulpit will be erected in St Anne's Cathedral car park on St Patrick's Day and after a few scheduled talks at noon to introduce the concept of taking ownership, it will be available for members of the public to ascend the stairs and give voice to their message. The traditional Christian pulpit can be understood as a vessel to deliver 'truths' to the masses; the Public Pulpit aspires to communicate the views of the masses of individuals. Open until 6pm. 2. Join Colin Hassard, Leyla Josephine and the winners of the 2017 Imagine! Belfast poetry and conflict competition for a night of spoken words and artistry in the Crescent Arts Centre at 7.30pm on Saturday 17 March. 1. The Sunflower Bar will host a four part tribute to Hip Hop from 7pm until midnight on Sunday 18 March with a screening of Bombin', Beats and B-Boys, a showcase of breakdancing, the Hip Hop Comedy Game Show and gritty collaboration between the Northcoaster DBMCs and special guests. And don't forget about the superb Quartered audio walk (reviewed), the civic conversation about Universal Basic Income, the panel discussion on Civil Rights, Democracy Day in the Crescent Arts Centre all day Wednesday 14, including a FactCheckNI session with students from Methodist College, and the Open Government Network's Re-imagine Democracy conference in The MAC on Thursday 14.